The classic malar rash, also known as a butterfly rash, of systemic lupus erythematosus, with distribution over the cheeks and nasal bridge. 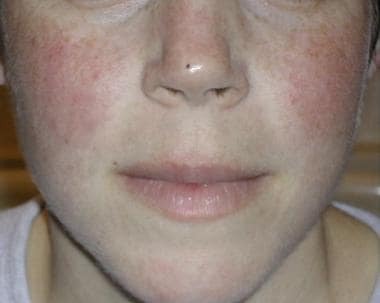 Note that the fixed erythema, sometimes with mild induration as seen here, characteristically spares the nasolabial folds. Photosensitive systemic lupus erythematosus rashes typically occur on the face or extremities, which are sun-exposed regions. Photo courtesy of Dr. Erik Stratman, Marshfield Clinic. Physical medicine and rehabilitation for SLE may involve physical therapy, occupational therapy, speech therapy, recreational therapy, or combinations thereof. Follow-up medical care of patients with SLE must be ongoing. One physician should coordinate the patient’s care. The physician and the patient must be alert to subtle changes in symptoms that may indicate a flare-up in the disease process. Physical therapy (PT) is often beneficial for patients with systemic lupus erythematosus (SLE). The role of the physical therapist is to assess each patient and to determine an effective plan of care to help reduce pain, stiffness, and inflammation, as well as to improve joint range of motion (ROM) and functional mobility. Key points to keep in mind when developing a PT program for a patient with SLE include the following. Arthritis is a common occurrence of SLE, with an incidence of 69-95%; however, it is usually less inflammatory than rheumatoid arthritis, although joint deformities may still occur. Arthritis in SLE occurs predominately in the hand and knee, yet most joints may be affected. For patients with predominant arthralgias or arthritis, techniques used in rheumatoid arthritis may be helpful. Incorporate isometric exercises for patients with joint inflammation, especially for the hip and knee (to help maintain biomechanical stability). Isotonic exercises can be used when joint inflammation is reduced or absent. Transfers and ambulation activities are important for maintaining mobility. Strengthening exercises are initiated when appropriate. Fatigue may hinder progress in some patients. ROM exercises in the presence of inflammation may induce more pain. Isometric exercises may be better tolerated. Hydrocollator packs can be helpful prior to completing ROM to help reduce pain and stiffness. If pain lasts for more than 1-1.5 hours following activity, the exercise regimen should be reduced in intensity and/or duration. Proper positioning may prevent joint contractures in patients with SLE. Do not use a pillow under a painful knee. Ultrasonography (US) is a modality commonly used to provide deep heat to the affected joint, but it should not be used in the presence of inflammation; ice is the preferred modality for inflamed joints. When US is used to improve ROM, movement of the joint and the application of US should be simultaneous. A pool, when available, is an excellent setting for exercising inflamed joints because of the buoyancy of the water (providing unloading of the joint) and the soothing quality of warm water. Assistive devices, such as canes and walkers, are often helpful based on the patient’s individual needs. The role of the occupational therapist (OT) is to help the patient regain as much of his or her functional independence as possible despite the problems caused by the disease. Principles of occupational therapy for patients with SLE include the following. Adaptive equipment may be necessary for patients to complete ADL tasks; some of the more common adaptive equipment includes a raised toilet seat, splints, and reachers. Elastic (no-tie) shoelaces and wide-handled tools may increase the degree of independence. Educating the patient in joint conservation techniques to protect the joints from damage is important. Paraffin baths are comforting for patients with hand involvement and may improve use. As stated previously, fatigue is one of the most frequent and debilitating symptoms that must be dealt with in patients with SLE. The OT can be helpful in teaching the patient energy conservation techniques, frequently using adaptive equipment. A home safety evaluation may be indicated. The OT can provide recommendations for equipment (eg, bathtub bench, raised toilet seat, grab bar) to increase the patient’s independence and safety with mobility at home. Gentleness is important in all settings. The speech pathologist can be helpful when a patient with SLE has slurred speech, difficulty understanding speech, or difficulty speaking appropriately. SLE patients with swallowing problems can also be evaluated and treated by the speech pathologist. The role of the recreational therapist (RT) is to involve the SLE patient in enjoyable activities that have therapeutic value. For example, a patient who has painful or weak hands, may benefit from putting a jigsaw puzzle together, which is a light activity that enhances the patient’s eye-hand coordination and his/her ability to match pieces by color. Patients can do this while standing or sitting (whichever is most appropriate) and at the same time can be socializing with other patients. Wallace DJ, Hahn BH, eds. Dubois' Lupus Erythematosus. 7th ed. Philadelphia, PA: Lippincott Williams & Wilkins; 2007. Mackillop LH, Germain SJ, Nelson-Piercy C. Systemic lupus erythematosus. BMJ. 2007 Nov 3. 335(7626):933-6. [Medline]. Rahman A, Isenberg DA. 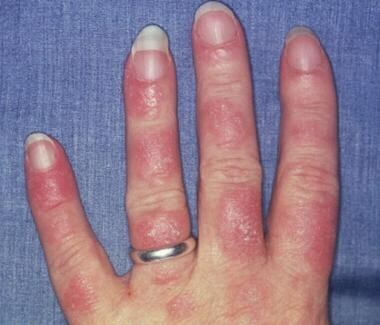 Systemic lupus erythematosus. N Engl J Med. 2008 Feb 28. 358(9):929-39. [Medline]. Jacobsen S, Petersen J, Ullman S, Junker P, Voss A, Rasmussen JM, et al. A multicentre study of 513 Danish patients with systemic lupus erythematosus. I. Disease manifestations and analyses of clinical subsets. Clin Rheumatol. 1998. 17(6):468-77. [Medline]. Gordon C, Isenberg D, Lerstrom K, Norton Y, Nikai E, Pushparajah DS, et al. The substantial burden of systemic lupus erythematosus on the productivity and careers of patients: a European patient-driven online survey. Rheumatology (Oxford). 2013 Dec. 52(12):2292-301. [Medline]. [Full Text]. Balsamo S, da Mota LM, de Carvalho JF, Nascimento Dda C, Tibana RA, Santos de Santana F. Low dynamic muscle strength and its associations with fatigue, functional performance, and quality of life in premenopausal patients with systemic lupus erythematosus and low disease activity: a case-control study. BMC Musculoskelet Disord. 2013. 14:263. [Medline]. Perandini LA, Sales-de-Oliveira D, Mello SB, et al. Exercise training can attenuate the inflammatory milieu in women with systemic lupus erythematosus. J Appl Physiol (1985). 2014 Sep 15. 117 (6):639-47. [Medline]. [Full Text]. Perandini LA, Sales-de-Oliveira D, Mello S, et al. Inflammatory cytokine kinetics to single bouts of acute moderate and intense aerobic exercise in women with active and inactive systemic lupus erythematosus. Exerc Immunol Rev. 2015. 21:174-85. [Medline]. Yuen HK, Breland HL, Vogtle LK, Holthaus K, Kamen DL, Sword D. The process associated with motivation of a home-based Wii Fit exercise program among sedentary African American women with systemic lupus erythematosus. Disabil Health J. 2013 Jan. 6(1):63-8. [Medline]. Eriksson K, Svenungsson E, Karreskog H, Gunnarsson I, Gustafsson J, Moller S. Physical activity in patients with systemic lupus erythematosus and matched controls. Scand J Rheumatol. 2012 Aug. 41(4):290-7. [Medline]. Clarke-Jenssen AC, Fredriksen PM, Lilleby V, Mengshoel AM. Effects of supervised aerobic exercise in patients with systemic lupus erythematosus: a pilot study. Arthritis Rheum. 2005 Apr 15. 53(2):308-12. [Medline]. Tench CM, McCarthy J, McCurdie I, White PD, D'Cruz DP. Fatigue in systemic lupus erythematosus: a randomized controlled trial of exercise. Rheumatology (Oxford). 2003 Sep. 42(9):1050-4. [Medline]. Braddom R. Chan L, Harrarast M, Kowalske K, Matthews D, Ragnarsson K, Stolp K. Physical Medicine & Rehabilitation. 4th ed. Philadelphia, PA: Elsevier; 2011. Hicks JE, Miller F, Plotz P, Chen TH, Gerber L. Isometric exercise increases strength and does not produce sustained creatinine phosphokinase increases in a patient with polymyositis. J Rheumatol. 1993 Aug. 20(8):1399-401. [Medline]. Del Pino-Sedeno T, Trujillo-Martín MM, Ruiz-Irastorza G, et al. Effectiveness of non-pharmacological interventions for decreasing fatigue in adults with systemic lupus erythematosus: a systematic review. Arthritis Care Res (Hoboken). 2015 Aug 3. [Medline]. Reis-Neto ET, Silva AE, Monteiro CM, Camargo LM, Sato EI. Supervised physical exercise improves endothelial function in patients with systemic lupus erythematosus. Rheumatology (Oxford). 2013 Dec. 52(12):2187-95. [Medline]. do Prado DM, Gualano B, Miossi R, Lima FR, Roschel H, Borba E. Erratic control of breathing during exercise in patients with systemic lupus erythematosus: a pilot-study. Lupus. 2011 Dec. 20(14):1535-40. [Medline]. Roussou E, Weerakoon A, Iacovou C, Ahmed K. Ethnic differences in the number of miscarriages, number of children, perceived family support and the impact of the disease on daily living in patients with systemic lupus erythematosus. Clin Rheumatol. 2013 Aug. 32(8):1223-8. [Medline]. Kozora E, Ellison MC, West S. Depression, fatigue, and pain in systemic lupus erythematosus (SLE): relationship to the American College of Rheumatology SLE neuropsychological battery. Arthritis Rheum. 2006 Aug 15. 55(4):628-35. [Medline]. Popescu A, Kao A. Neuropsychiatric systemic lupus erythematosus. Current Neuropharmacology. 2010. 9(3):449-57. Amissah-Arthur MB, Gordon C. Contemporary treatment of systemic lupus erythematosus: an update for clinicians. Ther Adv Chronic Dis. 2010 Jul. 1(4):163-75. [Medline]. This axial, T2-weighted magnetic resonance imaging (MRI) brain scan demonstrates an area of ischemia in the right periventricular white matter of a 41-year-old woman with longstanding systemic lupus erythematosus. She presented with headache and subtle cognitive impairments but no motor deficits. Faintly increased signal intensity was also seen on T1-weighted images, with a trace of enhancement following gadolinium that is too subtle to show on reproduced images. Distribution of the abnormality is consistent with occlusion of deep penetrating branches, such as that which may result from local vasculopathy, with no clinical or laboratory evidence of lupus anticoagulant or anticardiolipin antibody. Cardiac embolus from covert Libman-Sacks endocarditis remains less likely, due to distribution. Mesangial proliferative lupus nephritis with moderate mesangial hypercellularity. International Society of Pathology/Renal Pathology Society (ISN/RPS) 2003 class II (hematoxylin and eosin stain; 200X magnification). Focal lupus nephritis, immunofluorescence. International Society of Pathology/Renal Pathology Society (ISN/RPS) 2003 class III (200X magnification). Diffuse lupus nephritis with extensive crescent formation (rapidly progressive glomerulonephritis). International Society of Pathology/Renal Pathology Society (ISN/RPS) 2003 class IV (hematoxylin and eosin stain; 200X magnification). Membranous lupus nephritis showing thickened glomerular basement membrane. International Society of Pathology/Renal Pathology Society (ISN/RPS) 2003 class V (silver stain; 200X magnification).